Minneapolis ( ) is the largest city in the U.S. state of Minnesota and is the county seat of Hennepin County . The city lies on both banks of the Mississippi River, just north of the river's confluence with the Minnesota River, and adjoins Saint Paul , the state's capital. Known as the Twin Cities , these two form the core of Minneapolis-St. Paul , the sixteenth-largest metropolitan area in the United States, with 3.5 million residents. The Metropolitan Council estimated the city's population was 390,131 in 2009. The city is abundantly rich in water with over twenty lakes and wetlands, the Mississippi river, creeks and waterfalls, many connected by parkways in the Chain of Lakes and the Grand Rounds Scenic Byway. Minneapolis was once the world's flour milling capital and a hub for timber, and today is the primary business center between Chicago and Seattle . Named America's most literate city, Minneapolis has cultural organizations that draw creative people and audiences to the city for theater, visual art, writing, and music. The community's diverse population has a long tradition of charitable support through progressive public social programs and through private and corporate philanthropy. Dakota Sioux were the region's sole residents until French explorer arrived around 1680. Nearby Fort Snelling , built in 1819 by the United States Army, spurred growth in the area. The United States Government pressed the Mdewakanton band of the Dakota to sell their land, allowing people arriving from the east to settle there. The Minnesota Territorial Legislature authorized present day Minneapolis as a town on the Mississippi's west bank in 1856. Minneapolis incorporated as a city in 1867, the year rail service began between Minneapolis and Chicago. It later joined with the east bank city of St. Anthony in 1872. Minneapolis grew up around Saint Anthony Falls , the highest waterfall on the Mississippi. Millers have used hydropower since the 1st century B.C., but the results in Minneapolis between 1880 and 1930 were so remarkable the city has been described as "the greatest direct-drive waterpower center the world has ever seen." In early years, forests in northern Minnesota were the source of a lumber industry that operated seventeen sawmills on power from the waterfall. By 1871, the west river bank had twenty-three businesses including flour mills, woolen mills, iron works, a railroad machine shop, and mills for cotton, paper, sashes, and planing wood. The farmers of the Great Plains grew grain that was shipped by rail to the city's thirty-four flour mills where Pillsbury and General Mills became processors. By 1905, Minneapolis delivered almost 10% of the country's flour and grist. At peak production, a single mill at Washburn-Crosby made enough flour for twelve million loaves of bread each day. During the 1950s and 1960s as part of urban renewal, the city razed about two hundred buildings across twenty-five city blocks—roughly 40% of downtown, destroying the Gateway District and many buildings with notable architecture including the Metropolitan Building . Efforts to save the building failed but are credited with jumpstarting interest in historic preservation in the state. The history and economic growth of Minneapolis history are tied to water, the city's defining physical characteristic, which was sent to the region during the last ice age. Fed by receding glaciers and Lake Agassiz ten thousand years ago, torrents of water from a glacial river undercut the Mississippi and Minnehaha riverbeds, creating waterfalls important to modern Minneapolis. Lying on an artesian aquifer and otherwise flat terrain, Minneapolis has a total area of and of this 6% is water. Water is managed by watershed districts that correspond to the Mississippi and the city's three creeks. Twelve lakes, three large ponds, and five unnamed wetlands are within Minneapolis. The city center is located just south of 45° N latitude. The city's lowest elevation of is near where Minnehaha Creek meets the Mississippi River. The site of the Prospect Park Water Tower is often cited as the city's highest point and a placard in Deming Heights Park denotes the highest elevation, but a spot at in or near Waite Park in Northeast Minneapolis is corroborated by Google Earth as the highest ground. Minneapolis has a continental climate typical of the Upper Midwest. Winters can be cold and dry, while summer is comfortably warm although at times it can be hot and humid. On the Köppen climate classification, Minneapolis falls in the warm summer humid continental climate zone (Dfa); and has a USDA plant hardiness of zone 5. The city experiences a full range of precipitation and related weather events, including snow, sleet, ice, rain, thunderstorms, tornadoes, and fog. The warmest temperature ever recorded in Minneapolis was in July 1936, and the coldest temperature ever recorded was , in January 1888. The snowiest winter of record was 1983–84, when of snow fell. Because of its northerly location in the United States and lack of large enough bodies of water in close proximity to moderate the air, Minneapolis is sometimes subjected to cold Arctic air masses, especially during the months of January and February. The average annual temperature of gives the Minneapolis–St. Paul metropolitan area the coldest annual mean temperature of any major metropolitan area in the continental United States. Dakota tribes, mostly the Mdewakanton, as early as the 16th century were known as permanent settlers near their sacred site of St. Anthony Falls. New settlers arrived during the 1850s and 1860s in Minneapolis from New England , New York , and Canada , and during the mid-1860s, Scandinavians from Sweden , Finland , Norway and Denmark began to call the city home. Migrant workers from Mexico and Latin America also interspersed. Later, immigrants came from Germany , Italy , Greece , Poland , and Southern and Eastern Europe. These immigrants tended to settle in the Northeast neighborhood, which still retains an ethnic flavor and is particularly known for its Polish community. Jews from Russia and Eastern Europe settled primarily on the north side of the city before moving in large numbers to the western suburbs in the 1950s and 1960s. Asians came from China , the Philippines , Japan , and Korea . Two groups came for a short while during U.S. government relocations: Japanese during the 1940s, and Native Americans during the 1950s. From 1970 onward, Asians arrived from Vietnam , Laos , Cambodia , and Thailand . Beginning in the 1990s, a large Latino population arrived, along with immigrants from the Horn of Africa, especially Somalia (40,000 people). Into the 21st century, Minneapolis continues its tradition of welcoming newcomers. The metropolitan area is an immigrant gateway which had a 127% increase in foreign-born residents between 1990 and 2000. U.S. Census Bureau estimates in the year 2007 show the population of Minneapolis to be 377,392, a 1.4% drop since the 2000 census. The population grew until 1950 when the census peaked at 521,718, and then declined as people moved to the suburbs until about 1990. Among U.S. cities as of 2006, Minneapolis has the fourth-highest percentage of gay, lesbian, or bisexual people in the adult population, with 12.5% (behind San Francisco , and slightly behind both Seattle and Atlanta ). Racial and ethnic minorities lag behind Caucasian counterparts in education, with 15.0% of African American and 13.0% of Hispanics holding bachelor's degrees compared to 42.0% of the Caucasian population. The standard of living is on the rise, with incomes among the highest in the Midwest, but median household income among minorities is below that of whites by over $17,000. Regionally, home ownership among minority residents is half that of whites though Asian home ownership has doubled. In 2000, the poverty rates included Caucasians at 4.2%, African Americans at 26.2%, Asians at 19.1%, American Indians at 23.2%, and Hispanics at 18.1%. The economy of Minneapolis today is based in commerce, finance, rail and trucking services, health care, and industry. Smaller components are in publishing, milling, food processing, graphic arts, insurance, education, and high technology. Industry produces metal and automotive products, chemical and agricultural products, electronics, computers, precision medical instruments and devices, plastics, and machinery. 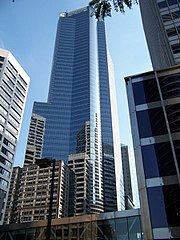 Five Fortune 500 headquarters are in Minneapolis proper: Target Corporation, U.S. Bancorp, Xcel Energy, Ameriprise Financial, and Thrivent Financial for Lutherans . With 18 in the Twin Cities Metropolitan area - the most per capita of any US City. Fortune 1000 companies in Minneapolis include PepsiAmericas, Valspar and Donaldson Company. Apart from government, the city's largest employers are Target, Wells Fargo, Ameriprise, Star Tribune, U.S. Bancorp, Xcel Energy, IBM, Piper Jaffray, RBC Dain Rauscher, ING Group, and Qwest. The Twin Cities contribute 63.8% of the gross state product of Minnesota. The area's $145.8 billion gross metropolitan product and its per capita personal income rank fourteenth in the U.S. Recovering from the nation's recession in 2000, personal income grew 3.8% in 2005, though it was behind the national average of 5%. The city returned to peak employment during the fourth quarter of that year. The Federal Reserve Bank of Minneapolis, with one branch in Helena, Montana , serves Minnesota, Montana , North and South Dakota , and parts of Wisconsin and Michigan . The smallest of the twelve regional banks in the Federal Reserve System, it operates a nationwide payments system, oversees member banks and bank holding companies, and serves as a banker for the U.S. Treasury. The Minneapolis Grain Exchange founded in 1881 is still located near the riverfront and is the only exchange for hard red spring wheat futures and option. The region is second only to New York City in live theater per capita and is the third-largest theater market in the U.S. after New York and Chicago, supporting the Illusion, Jungle, Mixed Blood, Penumbra, Mu Performing Arts, Bedlam Theatre, the Brave New Workshop, the Minnesota Dance Theatre, Red Eye, Skewed Visions, Theater Latté Da, In the Heart of the Beast Puppet and Mask Theatre, Lundstrum Center for the Performing Arts, and the Children's Theatre Company . The city is home to Minnesota Fringe Festival, the United States' largest nonjuried performing arts festival. French architect Jean Nouvel designed a new three stage complex for the Guthrie Theater , the prototype alternative to Broadway founded in Minneapolis in 1965. Minneapolis purchased and renovated the Orpheum , State, and Pantages Theatres vaudeville and film houses on Hennepin Avenue now used for concerts and plays. Eventually, a fourth renovated theater joined the Hennepin Center for the Arts to become the Minnesota Shubert Performing Arts and Education Center , a home to twenty performing arts groups and a provider of Web-based art education. The Minneapolis Institute of Arts , built in 1915 in south central Minneapolis is the largest art museum in the city with 100,000 pieces in its permanent collection. A new wing designed by Michael Graves was completed in 2006 for contemporary and modern works and more gallery space. The Walker Art Center sits atop Lowry Hill, near downtown, and doubled its size with an addition in 2005 by Herzog & de Meuron and is continuing its expansion to with a park designed by Michel Desvigne across the street from the Minneapolis Sculpture Garden . The Weisman Art Museum , designed by Frank Gehry for the University of Minnesota , opened in 1993. An addition, also designed by Gehry, is expected to open in 2009. The son of a jazz musician and a singer, Prince is Minneapolis' most famous musical progeny. With fellow local musicians, many of whom recorded at Twin/Tone Records, he helped make First Avenue and the 7th Street Entry venues of choice for both artists and audiences. Other prominent artists from Minneapolis include Soul Asylum and The Replacements, whose frontman Paul Westerberg went on to a successful solo career, and whose bassist Tommy Stinson plays in Guns N' Roses. The Minnesota Orchestra plays classical and popular music at Orchestra Hall under music director Osmo Vänskä who has set about making it the best in the country. In 2008, the century-old MacPhail Center for Music opened a new facility designed by James Dayton. Minneapolis and Seattle are tied as America's most literate city. A center for printing and publishing, Minneapolis was a natural place for artists to build Open Book, the largest literary and book arts center in the U.S., made up of the Loft Literary Center, the Minnesota Center for Book Arts and Milkweed Editions, sometimes called the country's largest independent nonprofit literary publisher. The center exhibits and teaches both contemporary art and traditional crafts of writing, papermaking, letterpress printing and bookbinding. Professional sports are well-established in Minneapolis. First playing in 1884, the Minneapolis Millers baseball team produced the best won-lost record in their league at the time and contributed fifteen players to the Baseball Hall of Fame . During the 1940s and 1950s the Minneapolis Lakers basketball team, the city's first in the major leagues in any sport, won six basketball championships in three leagues before moving to Los Angeles. The American Wrestling Association, formerly the NWA Minneapolis Boxing & Wrestling Club, operated in Minneapolis from 1960 until the 1990s. The Minnesota Vikings and the Minnesota Twins arrived in the state in 1961. The Vikings were an NFL expansion team and the Twins were formed when the Washington Senators relocated to Minnesota. Both teams played outdoors in the open air Metropolitan Stadium in the suburb of Bloomington for twenty years before moving to the Hubert H. Humphrey Metrodome , where the Twins won the World Series in 1987 and 1991. The Minnesota Timberwolves brought NBA basketball back to Minneapolis in 1989, followed by the Minnesota Lynx WNBA team in 1999. They play in the Target Center . The NHL ice hockey team Minnesota Wild and the National Lacrosse League team Minnesota Swarm play at the Xcel Energy Center . The USL-1 soccer team Minnesota Thunder plays in Blaine, a suburb of Minneapolis. The downtown Metrodome, opened in 1982, is the largest sports stadium in Minnesota. The three major tenants are the Vikings, the Twins, and the university's Golden Gophers baseball team. The Metrodome is the only stadium in the country to have hosted a Major League Baseball All-Star Game, the Super Bowl, the World Series, and NCAA Basketball Men's Final Four. Runners, walkers, inline skaters, coed volleyball teams, and touch football teams all have access to "The Dome". Events from sports to concerts, community activities, religious activities, and trade shows are held more than three hundred days per year, making the facility one of the most versatile stadiums in the world. The state of Minnesota authorized replacement of the Metrodome with three separate stadiums that estimates in 2007 totaled at about $1.7 billion. Six spectator sport stadiums will be in a 1.2-mile (2 km) radius centered downtown, counting the existing facilities at Target Center and the university's Williams Arena and Mariucci Arena . The new Target Field is funded by the Twins and 75% by Hennepin County sales tax, about $25 per year by each taxpayer. The Gopher football program's new TCF Bank Stadium is being built by the university and the state's general fund. The Vikings Stadium plan for Blaine, Minnesota changed and as of 2007 was estimated at $954 million for rebuilding on the Metrodome site. Feasibility studies for Dallas, Texas -based design and local construction (Mortenson Construction of Minneapolis) of a new stadium are expected in early 2009. The Minneapolis park system has been called the best-designed, best-financed, and best-maintained in America. Foresight, donations and effort by community leaders enabled Horace Cleveland to create his finest landscape architecture, preserving geographical landmarks and linking them with boulevards and parkways. The city's Chain of Lakes is connected by bike, running, and walking paths and used for swimming, fishing, picnics, boating, and ice skating. A parkway for cars, a bikeway for riders, and a walkway for pedestrians runs parallel along the route of the Grand Rounds Scenic Byway. Residents brave the cold weather in December to watch the nightly Holidazzle Parade. Theodore Wirth is credited with the development of the parks system. Today, 16.6% of the city is parks and there are of parkland for each resident, ranked in 2008 as the most parkland per resident within cities of similar population densities. Parks are interlinked in many places and the Mississippi National River and Recreation Area connects regional parks and visitor centers. The country's oldest public wildflower garden, the Eloise Butler Wildflower Garden and Bird Sanctuary located within Theodore Wirth Park which is shared with Golden Valley and is about 60% the size of Central Park in New York City. Site of the 53-foot (16 m) Minnehaha Falls , Minnehaha Park is one of the city's oldest and most popular parks, receiving over 500,000 visitors each year. Henry Wadsworth Longfellow named Hiawatha's wife Minnehaha for the Minneapolis waterfall in The Song of Hiawatha, a bestselling and often-parodied 19th century poem. Runner's World ranks the Twin Cities as America's sixth best city for runners. Team Ortho sponsors the Minneapolis Marathon, Half Marathon and 5K which began in May 2009 with more than 1,500 starters. The Twin Cities Marathon run in Minneapolis and St. Paul every October draws 250,000 spectators. The race is a Boston and USA Olympic Trials qualifier. The organizers sponsor three more races: a Kids Marathon, a , and a . Minneapolis is home to more golfers per capita than any major U.S. city. In other sports, five golf courses are located within the city, with nationally ranked Hazeltine National Golf Club , and Interlachen Country Club in nearby suburbs. The state of Minnesota has the nation's highest number of bicyclists, sport fishermen, and snow skiers per capita. Hennepin County has the second-highest number of horses per capita in the U.S. While living in Minneapolis, Scott and Brennan Olson founded (and later sold) Rollerblade, the company that popularized the sport of inline skating. Early Minneapolis experienced a period of corruption in local government and crime was common until an economic downturn in the mid 1900s. Since 1950 the population decreased and much of downtown was lost to urban renewal and highway construction. The result was a "moribund and peaceful" environment until the 1990s. Along with economic recovery the murder rate climbed. The Minneapolis Police Department imported a computer system from New York City that sent officers to high crime areas despite accusations of racial profiling; the result was a drop in major crime. Since 1999 the number of homicides increased during four years, and to its highest in recent history in 2006, and then as of 2008, went down 22% from 2007 and down 39% from 2006. Politicians debate the causes and solutions, including increasing the number of police officers, providing youths with alternatives to gangs and drugs, and helping families in poverty. For 2007, the city invested in public safety infrastructure, hired over forty new officers, and has a new police chief, Tim Dolan. Minneapolis Public Schools enroll 36,370 students in public primary and secondary schools. The district administers about one hundred public schools including forty-five elementary schools, seven middle schools, seven high schools, eight special education schools, eight alternative schools, nineteen contract alternative schools, and five charter schools. With authority granted by the state legislature, the school board makes policy, selects the superintendent, and oversees the district's budget, curriculum, personnel, and facilities. Students speak ninety different languages at home and most school communications are printed in English, Hmong, Spanish, and Somali. About 44% of students in the Minneapolis Public School system graduate, which ranks the city the 6th worst out of the nation's 50 largest cities. Besides public schools, the city is home to more than twenty private schools and academies and about twenty additional charter schools. Minneapolis Community and Technical College , the private Dunwoody College of Technology , Globe University/Minnesota School of Business, and Art Institutes International Minnesota provide career training. Augsburg College , Minneapolis College of Art and Design, and North Central University are private four-year colleges. Capella University , Minnesota School of Professional Psychology, and Walden University are headquartered in Minneapolis and some others including the public four-year Metropolitan State University and the private four-year University of St. Thomas have campuses there. The Hennepin County Library system operates the city's public libraries. The Minneapolis Public Library faced a severe budget shortfall for 2007, and was forced to close three of its neighborhood libraries. The new downtown Central Library designed by César Pelli opened in 2006. Ten special collections hold over 25,000 books and resources for researchers, including the Minneapolis Collection and the Minneapolis Photo Collection. At recent count 1,696,453 items in the system are used annually and the library answers over 500,000 research and fact-finding questions each year. In 2007, Minneapolis was named America's most literate city. The study, conducted by Live Science, surveyed 69 U.S. cities with a population over 250,000. They focused on six key factors: Number of book stores, newspaper circulation, library resources, periodical publishing resources, educational attainment and Internet resources. In second place was Seattle, Washington and third was Minneapolis' neighbor, St. Paul , followed by Denver, Colorado and Washington, D.C.
Hiawatha Line LRV near Cedar/Riverside station. Half of Minneapolis-Saint Paul residents work in the city where they live. Most residents drive car but 60% of the 160,000 people working downtown commute by means other than a single person per auto. Alternative transportation is encouraged. The Metropolitan Council's Metro Transit, which operates the light rail system and most of the city's buses, provides free travel vouchers through the Guaranteed Ride Home program to allay fears that commuters might otherwise be occasionally stranded if, for example, they work late hours. The Minneapolis metro system consists of two lines. The Hiawatha Line or yellow line LRT serves 34,000 riders daily and connects the Minneapolis-St. Paul International airport and Mall of America to downtown. Most of the line runs at surface level, although parts of the line run on elevated tracks (including the Franklin Ave. and Lake St./Midtown stations) and approximately of the line runs underground, including the Lindbergh terminal subway station at the airport. The 40-mile Northstar Commuter rail or blue line, which runs from Big Lake through the northern suburbs and terminates at the multi-modal transit station at Target Field opened on November 16, 2009. It utilizes existing railroad tracks and will serve a projected 5,000 daily commuters. The planned third line, the Central Corridor or red line, will share stations with the Hiawatha line in downtown Minneapolis, and then at the Downtown East/Metrodome station, travel east through the University of Minnesota, and then along University Ave. into downtown St. Paul. Construction will begin in 2010 and expected completion is in 2014. The fourth line, the Southwest or green line, will connect downtown Minneapolis with the southwestern suburb of Eden Prairie. Completion is expected in 2015. Seven miles (11 km) of enclosed pedestrian bridges called skyways, the Minneapolis Skyway System, link eighty city blocks downtown. Second floor restaurants and retailer connected to these passageways are open on weekdays. The taxicab ordinance requires 10% wheelchair accessibility by 2009 and some use of alternative fuel or fuel efficient vehicles. Starting in 2011 the city's limit of 343 taxis will be lifted. Minneapolis ranks second in the nation for the highest percentage of commuters by bicycle. Ten thousand cyclists use the bike lanes in the city each day, and many ride in the winter. The Public Works Department expanded the bicycle trail system from the Grand Rounds to 56 miles (90 km) of off-street commuter trails including the Midtown Greenway , the Light Rail Trail, Kenilworth Trail, Cedar Lake Trail and the West River Parkway Trail along the Mississippi. Minneapolis also has 34 miles (54 km) of dedicated bike lanes on city streets and encourages cycling by equipping transit buses with bike racks and by providing online bicycle maps. Many of these trails and bridges, such as the Stone Arch Bridge , were former railroad lines that have now been converted for bicycles and pedestrians. In 2007 citing the city's bicycle lanes, buses and LRT, Forbes identified Minneapolis the world's fifth cleanest city. Minneapolis-Saint Paul International Airport (MSP) sits on on the southeast border of the city between Minnesota State Highway 5, Interstate 494 , Minnesota State Highway 77, and Minnesota State Highway 62. The airport serves three international, twelve domestic, seven charter and four regional carriers and is a hub and home base for Northwest Airlines, Mesaba Airlines, and Sun Country Airlines. Amtrak's Empire Builder between Chicago and Seattle stops once daily in each direction at nearby Midway Station in St. Paul. Five major newspapers are published in Minneapolis: Star Tribune, Finance and Commerce, Minnesota Spokesman-Recorder, the university's The Minnesota Daily and MinnPost.com. Other publications are the City Pages weekly, the Mpls.St.Paul and Minnesota Monthly monthlies, and Utne magazine. In 2008 readers of online news also used Minnesota Independent, Twin Cities Daily Planet, Downtown Journal, Cursor, MNSpeak and about fifteen other sites. The New York Times said in 1996, "Now there are T-shirts that read, 'Murderapolis,'" a name for the city that members of the local media have mistakenly attributed to the paper. The city's first television was broadcast by the St. Paul station and ABC affiliate KSTP-TV . The first to broadcast in color was WCCO-TV , the CBS affiliate which is located in downtown Minneapolis. The city also receives FOX, NBC, PBS, MyNetworkTV, and The CW through their affiliates and one independent station. Twins Brandon and Brenda Walsh were from Minneapolis on the TV series Beverly Hills, 90210. American Idol held auditions for its sixth season in Minneapolis in 2006 and Last Comic Standing held auditions for its fifth season in Minneapolis in 2007. A statue of Mary Tyler Moore downtown on the Nicollet Mall commemorates the legendary 1970s CBS television situation comedy fictionally based in Minneapolis, The Mary Tyler Moore Show. It marks the site where part of the series' iconic opening sequence was shot. The show was awarded three Golden Globe and thirty-one Emmy Awards. The Dakota people, the original inhabitants of the area where Minneapolis now stands, believed in the Great Spirit and were surprised that not all European settlers were religious. Over fifty denominations and religions and some well known churches have since been established in Minneapolis. Those who arrived from New England were for the most part Christian Protestants, Quakers, and Universalists. The oldest continuously used church in the city, Our Lady of Lourdes Catholic Church in the Nicollet Island/East Bank neighborhood was built in 1856 by Universalists and soon afterward was acquired by a French Catholic congregation. Formed in 1878 as Shaarai Tov, in 1902 the first Jewish congregation in Minneapolis built the synagogue in East Isles known since 1920 as Temple Israel. St. Mary's Orthodox Cathedral was founded in 1887, opened a missionary school in 1897 and in 1905 created the first Russian Orthodox seminary in the U.S. The first basilica in the U.S., the Roman Catholic Basilica of Saint Mary near Loring Park was named by Pope Pius XI. The Billy Graham Evangelistic Association, Decision magazine, and World Wide Pictures film and television distribution were headquartered in Minneapolis for about forty of the years between the late 1940s into the 2000s. Jim Bakker and Tammy Faye met while attending the Pentecostal North Central University and began a television ministry that by the 1980s reached 13.5 million households. Today, Mount Olivet Lutheran Church in southwest Minneapolis has 6,000 active members and is the world's largest Lutheran congregation. Christ Church Lutheran in the Longfellow neighborhood is among the finest work by architect Eliel Saarinen. The congregation later added an education building designed by his son Eero Saarinen. Philanthropy and charitable giving are part of the community. More than 40% of adults in Minneapolis-St. Paul give time to volunteer work, the highest percent in the U.S. Catholic Charities is one of the largest providers of social services locally. The American Refugee Committee helps one million refugees and displaced persons in ten countries in Africa, the Balkans and Asia each year. Although no Minneapolis businesses are top corporate citizens, Business Ethics was based in Minneapolis and was the predecessor of CRO magazine for corporate responsibility officers. The oldest foundation in Minnesota, the Minneapolis Foundation invests and administers over nine hundred charitable funds and connects donors to nonprofit organizations. The metropolitan area gives 13% of its total charitable donations to the arts and culture. The majority of the estimated $1 billion recent expansion of arts facilities was contributed privately. HCMC opened in 1887 as City Hospital and was also known as General Hospital. A public teaching hospital and Level I trauma center, the HCMC safety net sees 325,000 clinic visits and 100,000 emergency room visits each year and in 2008 provided about 18% of the uncompensated care given in Minnesota. Governor Tim Pawlenty balanced the state's budget with a line-item veto of the General Assistance Medical Care program, and as a result HCMC closed two clinics, reduced its staff, and reduced access to non-emergency services. Utility providers are regulated monopolies: Xcel Energy supplies electricity, CenterPoint Energy supplies gas, Qwest is the landline telephone provider, and Comcast is the cable service. In 2007 city-wide wireless internet coverage began, provided for 10 years by US Internet of Minnetonka to residents for about $20 per month and to businesses for $30. Minneapolis is one of the first cities to implement city-wide, public Wi-Fi, and as of December 2008, 85% to 90% of the city was covered, although spots lacking coveage persisted on the East- and West-Central sections of the city. The city treats and distributes water and requires payment of a monthly solid waste fee for trash removal, recycling, and drop off for large items. Residents who recycle receive a credit. Hazardous waste is handled by Hennepin County drop off sites. After each significant snowfall, called a snow emergency, the Minneapolis Public Works Street Division plows over one thousand miles (1609 km) of streets and four hundred miles (643.7 km) of alleys—counting both sides, the distance between Minneapolis and Seattle and back. Ordinances govern parking on the plowing routes during these emergencies as well as snow shoveling throughout the city. Minneapolis used to be sister cities with Winnipeg (Canada ). Atmosphere (January 4, 2005). "I Wish Those Cats @ Fobia Would Give Me Some Free Shoes" and "Sep Seven Game Show Them" and "7th St. Entry" on Headshots: SE7EN remastered. Rhymesayers, ASIN: B0006SSRXS [Explicit lyrics].